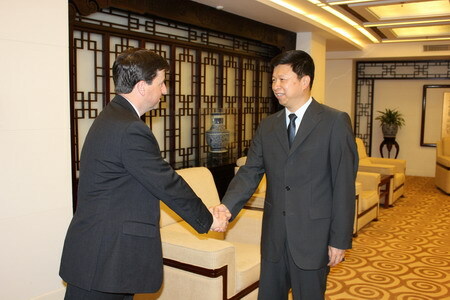 On June 12, 2012, Vice Foreign Minister Song Tao met with Douglas Alexander MP, British Labour’s Shadow Foreign Secretary. The two sides conducted frank and in-depth exchange of views on China-UK relations. Vice Minister Song said that the Labour Party attaches importance to the development of the China-UK relations. He hoped that Mr. Alexander and the Labour Party would continue to play its role in promoting sound development of the bilateral relationship. Alexander said that the new leadership of the Labour Party admires China’s achievements in development. They are committed to learning from each other and sharing experience with China and to deepening the relations between the two countries. The two sides also exchanged views on the Euro debt crisis, the Syrian issue and other topics.